We're big fans of Kate Jenkins – the talented knit and crochet artist and creator of the most fantastic knitted food you’ll ever see! We first spotted artist Kate Jenkins on BBC’s The One Show early in 2015, proudly showing off her impressive hand-knitted dinner. She’d hand-embellished a life-sized plaice with shimmering silver sequins and dished it up with woolly chips and a crocheted lemon wedge. 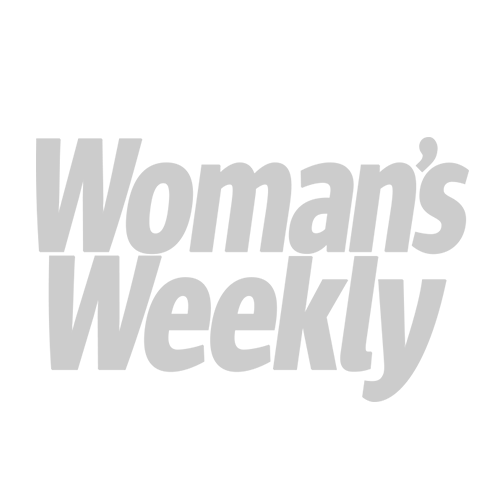 Whatever else? We were instantly hooked and have been thinking about her artwork ever since. Kate began knitting whimsical food items in an effort to promote her more traditional designs including cushions and shawls. After her television appearance she found a brand new school of followers as her popularity as an innovative fibre artist went through the roof. 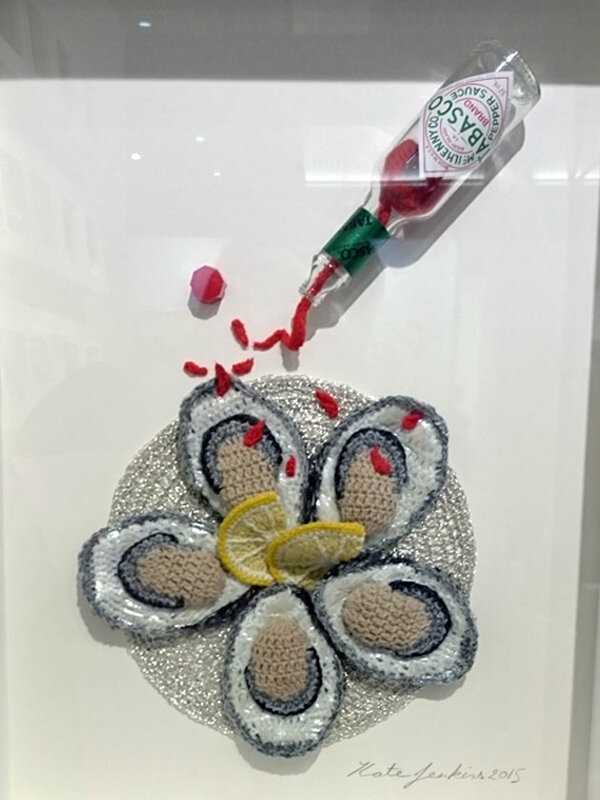 As well as the fish, she’s been involved with a great many other unique design projects and collaborations but our favourites are her one-of-a-kind knitted food pieces. 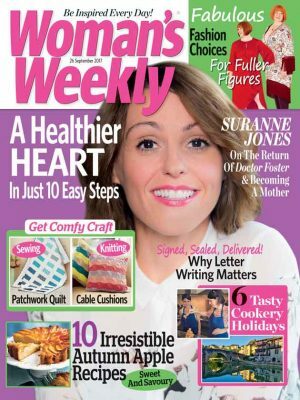 Kate’s most recent project – The Stitchmongers – is something very exciting indeed. We’d never seen anything quite like it! 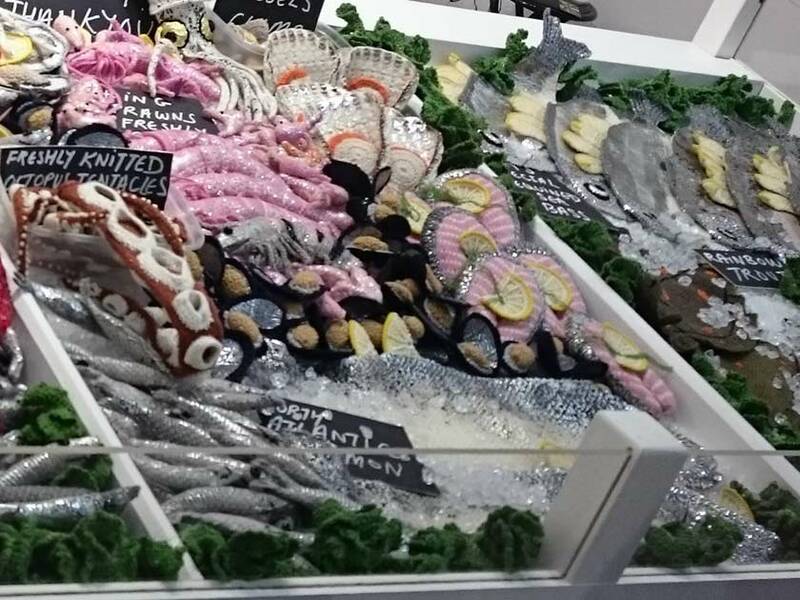 ‘Inspired by my love of seafood and all things fishy I have created an entire fish shop made entirely from wool,’ she says. The Stitchmongers is a real whale of an exhibit consisting of a full-size fish counter fully-stocked with life-sized fibre fish and other seafood. Kate’s painstakingly created every individual bite by hand. A task that took an impressive 9 months to create. We sailed in to see these immaculate creations for ourselves and were well and truly blown away! Aren’t they incredible? 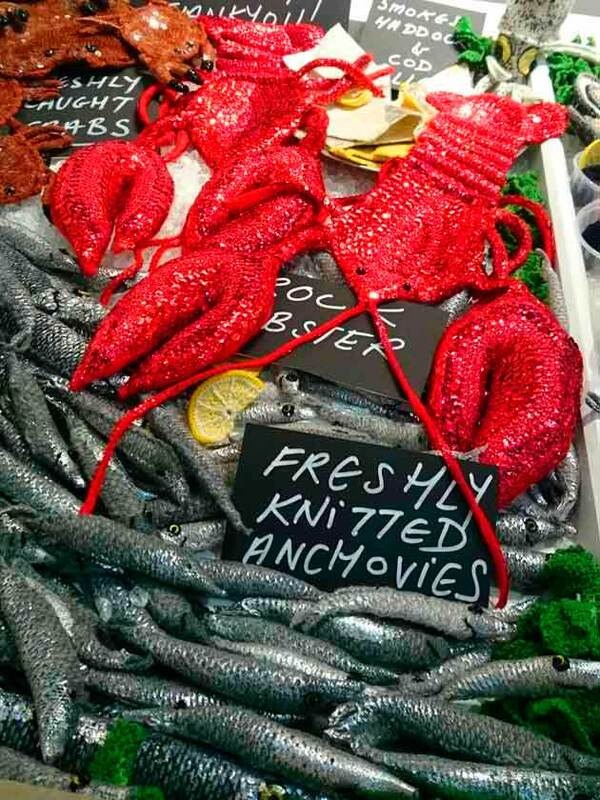 It’s a fantastic catch – a spectacular spread of different creatures, including glitter-encrusted crustaceans, tinned sparkling sardines, bold red lobsters and woolly mussels. And with none of the pong of the real thing! 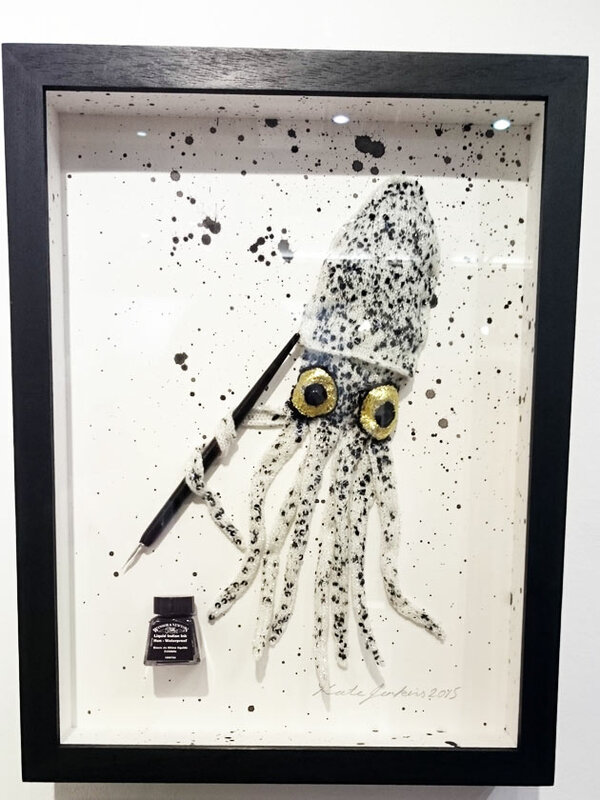 The fine detail to Kate Jenkins’ work makes each individual creature looks surprisingly life-like, but with the fun bit of added bling with glitzy sequins shimmering in the spotlights. In all, the exhibit is whimsical and playful but also deeply inspiring. To think that anyone can hand knit fiddly prawns and scallop shells quite like this has really opened our eyes to the excitng world of knitted nibbles.